Our Calibration System is widely accepted in various places for scanning purpose. Since our inception, we are engaged in presenting a wide range of excellent quality Sound Calibrators. It is a portable, multi-channel, synchronous sampling and analysis system, which used for large rotary machines. The offered system is particularly developed for the key equipment diagnosis that included large generating set, compressor, fan, pump, and rolling mill. There is a variety of applications developed and designed to help clients track and capture data related to it. Also, clients can get the system model 908s from us at industry leading rates. Distortion Total harmonic distortion : 2%. Operating Temp 0 °C to 50 °C (32 °F to 122 °F). Power Supply Heavy duty or Alkaline type, SC 9V battery. 006P, MN1604 (PP3) or equivalent, 2 PCs. Battery Check Build in "Battery test indicator"
Dimension Round 50mm dia. x 82 mm. Weight (including batteries) Approx. 340 g/0.75 LB. It is a portable ambient temperature black body used for single point calibration verification and checking of Infrared Thermal Imaging Cameras and Point Infrared Thermometers. To use this portable black body simply turn the instrument on and choose either °F or °C. Set your thermal imaging camera or IR thermometer to the correct emissivity. Aim at the target area and compare the readings. The result will confirm your infrared unit is within tolerance, and you can calculate the correction for zero error. 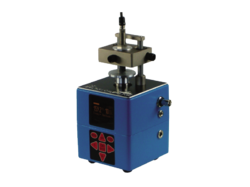 GJX-5 Can be used to calibrate vibration accelerometer, velocity and proximity transducer. 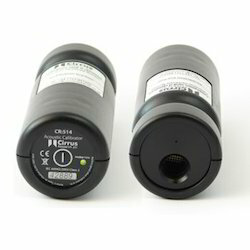 It can also be used to calibrate vibration monitoring /measuring instruments or data acquisition / data collector devices. 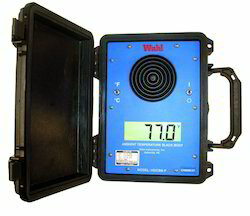 Standard sine signals at continually varying frequency from 10, to 1280 Hz can be generated from the calibrator. The amplitude of the acceleration, velocity and displacement can be defined and shown on LCD digital panel. Either horizontal or vertical vibration can be generated. GJX-5 combines sine signal generator, power amplifier, standard transducer and a shaker in one and features a small volume, high accuracy and easy operation. Use either in lab or on site. - Frequency (continually adjustable): 10 to1280Hz +0.01%. 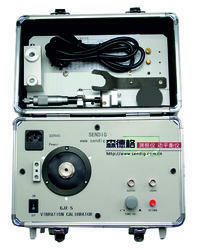 Looking for Calibration System ?